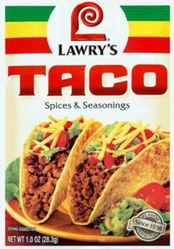 Lawrys Taco Seasoning Mix for the flavor of traditional tacos, try this blend of paprika, cumin, oregano, chili peppers, onion and garlic. Turns dinner into a fun-filled fiesta, pronto! Not only for tacos, try using to spice up burgers, tomato sauce, meat loaf, casseroles, dips and even breading for baked chicken. Perfect for family meals or weekend get-togethers, tacos just got even easier to prepare. 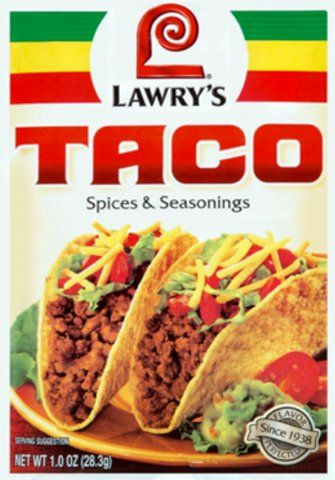 LAWRY'S� blend of cumin, chili peppers, oregano, and garlic give your taco mixings that authentic Mexican flavor without the effort. TACO Spices and Seasonings Mix es una Mezcla de especias para sazonar tacos tama�o familiar 2 oz 56.7 g.